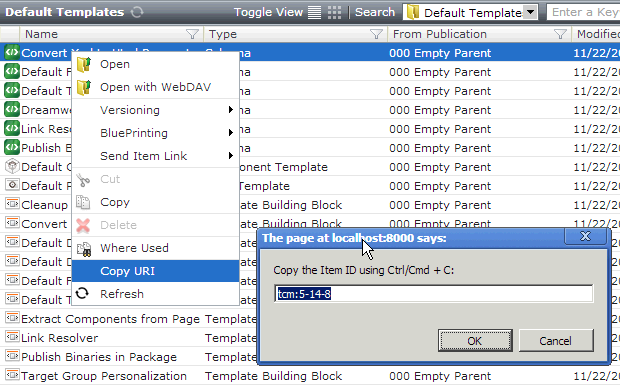 This is a small example of how to create a context-menu extension to copy the URI of a Tridion Item. The most important and also difficult part of every GUI Extension is the configuration file. It’s best to start with a previous working example. For this article I used the classic 8 Steps post from Yoav Nirlan. I started with the configuration file from the Tutorial and also loaded the Schemas into Visual Studio from Tridion. This was a very important step because Tridion 2011 SP1 has a slightly different XML Schema for the Context Menu than Yoav’s sample does. 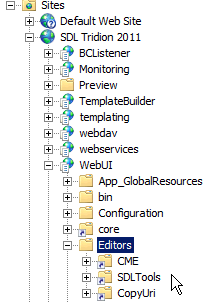 I relied on the intellisenne in Visual Studio and the XML Schema to get a properly formatted Configuration file. In the future I will start with this updated config file below for Context-menu extensions. Save it as CopyUri.config in the folder created above. The Commands are in the xml root ‘commands’ node, not the ‘ext:commands’. No Ribbon button was added in this demo. 1. Create a new folder ‘Commands’. 1. The isEnabled method tells the GUI if the menu option is enabled or disabled. This extension shows the URI for only one item, so I only enable the extension if one item is selected. Create a new Virtual Directory in WebUI/Editors called CopyUri. This name needs to be the same as the VDIR in the config from the next step. You may need to update the Security settings for the folder and allow the Network Service user read access. Use the ‘Test’ button after setting up and you should have a checkmark next to the first test. The second test will fail and this is normal. Add the following to ‘turn on’ the Extension. If your Tridion GUI stops working – comment out the following line and it should return to normal. Double-check your config and settings. 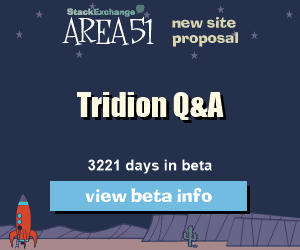 Big thanks to Alex Klock from Tridion Community for answering my question about getting the WebDavURL in Anguilla. Here is the code we could add to the execute method above to show the WebDav URL instead of URI. // WebDavUrl for cached item hasn't been loaded yet, so lets load it. Thanks for sharing Robert. I see a small improvement for your code. Btw, why don’t you route the isAvailable method to the isEnabled method? Than you only get the context menu option when it’s relevant.